Slide out trays are perfect for saving valuable desk top space from large printers and fax machines. Smooth metal side drawer glides ensure easy movement for heavy equipment while wire provisions are built-in behind the drawer to keep all cords organized and out of the way. Create a professional work environment with this classically, elegant credenza. Equipped with ample storage space you can keep all of your most valuable resources organized and available right at your finger tips. Expertly crafted from pine solids with cherry and birch veneers this piece is bathed in a warm brown cherry finish to give your office a cozy feel. Stacked crown mouldings, and framed doors give this office piece a traditional design. Two doors conceal slide out drawers for printer and fax machines and along with three drawers are adorned with dark finished knob hardware. The Chateau Valley Tradtional Jr Executive Credenza by Liberty Furniture at A1 Furniture & Mattress in the Madison, WI area. Product availability may vary. Contact us for the most current availability on this product. 901-HO120T Jr Executive Credenza Top 1 0" 0" 0"
901-HO120B Jr Executive Credenza Base 1 66" 25" 30"
Warm and inviting you and your clients will feel at home with this traditional office collection. 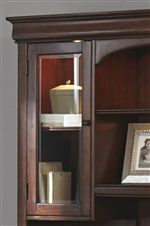 Crafted from select pine and poplar solids each piece carries cherry and birch veneers in a brown cherry finish. Dark finished knob hardware adorns framed doors and drawers and offer a polished appeal. Sliding trays for printers and scanners along with locking file drawers, adjustable lighting and wire management provisions to help make your office completely functional. 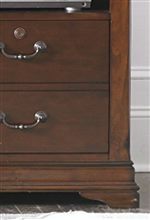 The Chateau Valley collection is a great option if you are looking for Traditional furniture in the Madison, WI area. Browse other items in the Chateau Valley collection from A1 Furniture & Mattress in the Madison, WI area.